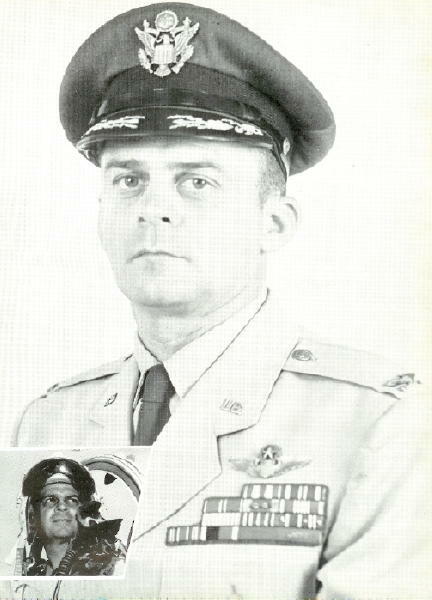 All pictures on this page, including the F-100 above and the information about Colonel Danial were taken from the 1957 England Tower - The Year Book for England AFB in 1957. Perhaps no single individual more closely personified the vigorous spirit of the 366th Fighter Bomber Wing than Colonel William A. Daniel, Commander of England Air Force Base until late August. An Englander for four years, the Colonel's Central Louisiana assignment lacked only seven months being the full duration of the 366th Wing's tenure as the parent organization. And these were action packed years. The 366th Fighter Bomber Wing stretched to its full stature as a prime component of the Tactical Air Command. England units spanned the Atlantic Ocean on tactical overseas rotational moves. In-flight re­fueling for the fighter-bomber aircraft became a reality. And the "Tigers," as these pilots and their crews were aptly called, deployed throughout the United States, participating in firepower demonstrations. All the while, the Wing's Commander, never content with complacency, instilled in his men a desire to convert superior efforts into mission accomplishment. His out spoken and forceful policies paid dividends. The Wing successfully undertook the aircraft transition cycle four times. The F-51 Mustang came and left; as did the F.86 Sabre Jet; then the F.84F Thunderstreak swept over the England skies. And in May of this year, Colonel Daniel landed with the first of what he described as "the Cadillac or Lincoln of fighter aircraft." The F-I00 Super Sabre, the swiftest and most potent of them all, had arrived. For the base, a new era of aircraft had begun. No doubt, this vigorous and varied career has molded the Colonel's esprit, the esprit of a fighter pilot. Because of Colonel Daniel, many at England Air Force Base have come to regard their motto, "Fortune Favors the Bold," as more than a motto. To them, this has become a practical application for mission success. Like many other senior Air Force officers, Colonel Daniel had seen a number of these eras. Back in 1937, the Boeing P-12, a small biplane, was the first fighter aircraft that he flew. He fought and lived through World War II, but over five German aircraft relented to his guns as the Birmingham, Alabama, Colonel emerged as an "Ace." As a military pilot, he has traveled the world.